That's right, we've got the "HELP WANTED" sign out! As we announced at the August meeting, Emily Thompson has moved from the board position of Secretary to VP of Communications. Since that time, Emily has been wearing both hats and working her fingers to the bone! If you're interested in joining the Austin MQG Executive Board as Secretary, please contact me - Mary Anne Williams at president@austinmodernquiltguild.com. What a fun and exciting challenge it would be as part of growing our Guild! - Compiling a guild scrapbook chronicling the years activities and accomplishments. Sounds AWESOME, right? Let me know if you're interested!!! What a great meeting we had in August at BookPeople! It followed closely on the heels of the August retreat, so lots of people had treasures to share. Be sure to check the end of this post for exciting announcements. We had a lovely selection of door prizes from local artists and shops! Margaret's rainbow quilt was the featured quilt of the month and it was proudly on display during the meeting. We all oo'ed and ahh'ed over the great fabrics included in this patchwork beauty. Membership cards have arrived! If you are unable to make it to meetings, please let us know and we'll arrange to get yours to you. Now on to the business side of things. President Mary Anne announced that Emily is the new VP of Communications and asked for interested parties to contact her regarding the now vacant Secretary position. Treasurer Jill shared that we have seven new members since our last meeting. We had 8 visitors at this meeting and it was unofficially bring your mom to quilt guild meeting night because there were several members' moms in the crowd. Thanks for joining us! If you're interested in officially becoming a member of the guild, please look here. VP of Events Corinne gave a recap on the retreat. A record number of 10 people attended and were apparently super productive. Christi can make exactly 7 quilts from start to finish in one day is what I heard... Corinne also announced that we are working out the details to have Sew Ins at local shops TBA. VP of Communications Emily announced that we will be having a Block of the Month (BOM) challenge to stimulate our charity and outreach program. This month's BOM info is up on the blog here and be sure to bring yours to the next meeting to be included in the drawing! Our featured speaker was Heather Grant, a founding member of the Austin MQG and also of the Modern Quilt Guild. She gave a great talk on the History of Modern Quilting. Unfortunately we were not allowed to video tape this talk, but the good news is it will be available through the Modern Quilt Guild in October or November this year. Heather also thanked everyone for helping out with the quilt the guild gave to her last month. You're very welcome! Next, VP of Communications Emily talked about Getting Connected to Modern Quilting via various types of social media and how you can get involved with blogs, blog readers, Facebook, Instagram, Flickr, and on and on. Find her presentation here and please let us know if you have questions! Show and Tell was awesome this month, to say the least! Some very special announcements were made at the end of the meeting that you won't want to miss! September 12 meeting will be all about pre-cuts! We voted for charm square demos so if you want to do a demo, please contact President Mary Anne to set it up. A Moda fabric challenge is in the works and hopefully we'll be distributing fabric at the September meeting. Guess who's coming to town - Jacquie Gering!! Our October meeting will be a lecture and trunk show free to members on Monday, October 28 from 7-9 pm in a location TBA. Admission will be charged to non-members. Jacquie will be giving two workshops on Monday, October 28 and Tuesday, October 29 from 10-4 each day. Cost will not be more than $100 for members. The workshops will be the Modern Crazy Piecing and the Stitch and Flip, with more details regarding price and sign-ups TBA. Whew, that was a long post! Thanks for reading all the way through and we hope to see you at the next meeting September 12, 6:30 pm at BookPeople! If you made it to the August meeting, you may recall me showing off a few quilt blocks and talking about a new challenge for the year. If you didn't make it, that's ok, we'll forgive you this time. Here's the scoop. Every month I'll be posting instructions for making a different quilt block describing all you need - fabric colors, cutting measurements, and directions on how to put it together. If you want to participate, make as many blocks as you like and bring them to the meeting. During the meeting, my committee members will sort the blocks randomly into a pile for a giveaway drawing and another pile for us to keep to make into awesome outreach quilts. For each block you bring, you get a chance to win the giveaway pile. Bring 1 block, get 1 chance. Bring 10 blocks, get 10 chances! We'll be keeping track of how many blocks you make and there will be prizes for the top contributors! 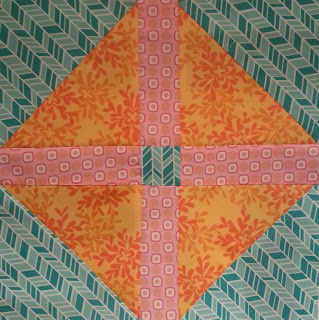 For this block, we'll be making half square triangles (HST) by a method you might not have tried before. We'll be making all 4 HST at the same time using a bigger square and then trimming them down. Please use any combo of orange, blue, and pink fabric. These instructions use the colors I picked so you can follow along with the pictures. 1. Place the 9"x 9" squares on top of each other, right sides together (RST). Pin if you like. You are going to sew 1/4" from the edge all the way around the square, overlapping stitches a little where they meet. Sew 1/4" from the edge all the way around. Pivot at the corners, keeping 1/4" away. 2. 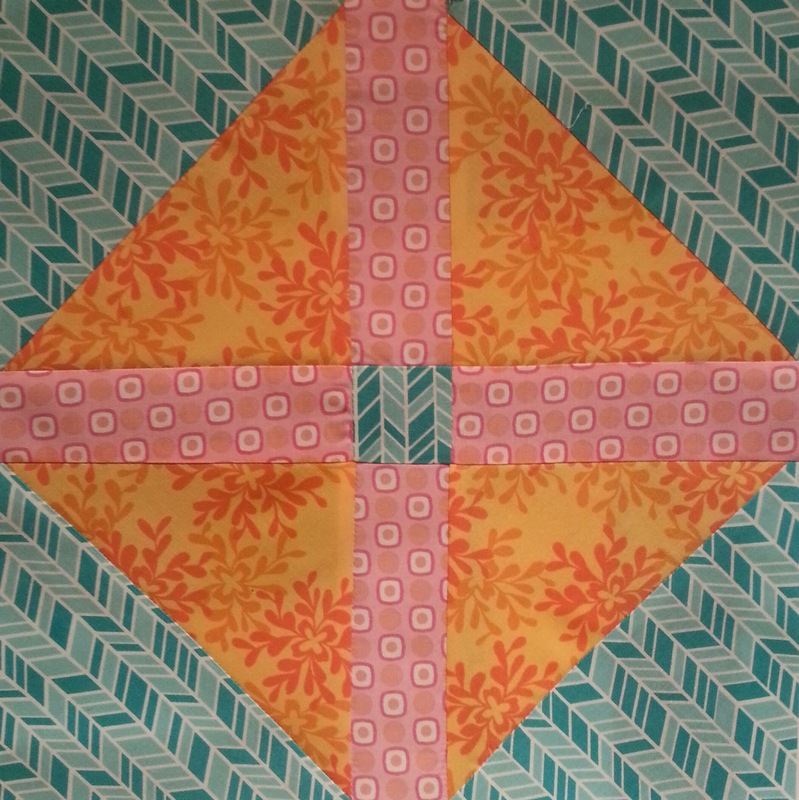 Cut this fabric sandwich into four triangles diagonally from opposite corners. Iron the HST units (open or to the side, I won't come after anyone). Trim each HST to 5 3/4" x 5 3/4". 3. Position the pieces like the photo and sew them all together using 1/4" seam. Iron and repeat as many times as you like! The block should now measure 12.5" x 12.5". If you have any questions about this tutorial, please don't hesitate to ask through the comments section or by emailing me. I can't wait to see what you bring to the meeting! Feel free to post pictures of your finished blocks in our Flickr group. It's that time again! What have you been working on this weekend? Show us what you worked on at the retreat last weekend. I was out of town for the weekend, but I still managed to get some sewing done. Did you know you can take scissors in your carry on bag as long as the blade is less than 4"? I luckily kept all my hexie hand sewing supplies with me during my trip. Link up your projects! 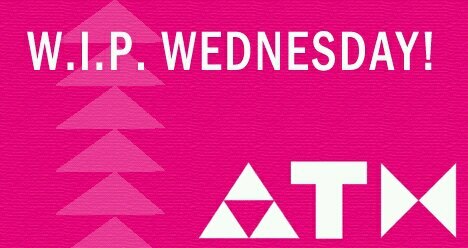 And don't forget the meeting is Thursday at 6:30 at Book People. Meeting Agenda: Get Connected to Modern Quilting! We will start the meeting promptly at 6:30pm. Please check-in at the membership table before finding a seat. We'll welcome any new visitors that are in attendance. c. Events - Corinne will discuss upcoming August and November retreats at the Wimberley Quilt Ranch. You can sign up here. Program: Get Connected to Modern Quilting! Members will talk about blogging, Instagram, Flickr swaps, and more. September will be an exciting meeting! You won't want to miss it - guest speakers and a challenge will be announced.